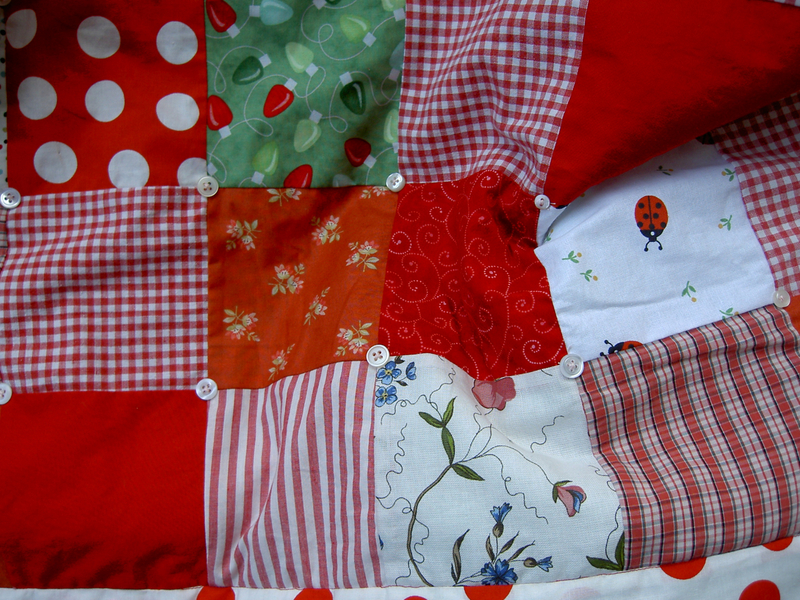 Well, it’s not actually three French hens today, but instead a Christmas quilt for my very small true love, Master A. If Christmas lasts twelve days (and not four months from September as the shops would have us believe…), then my latest little scrap quilt was finished in time for Christmas. 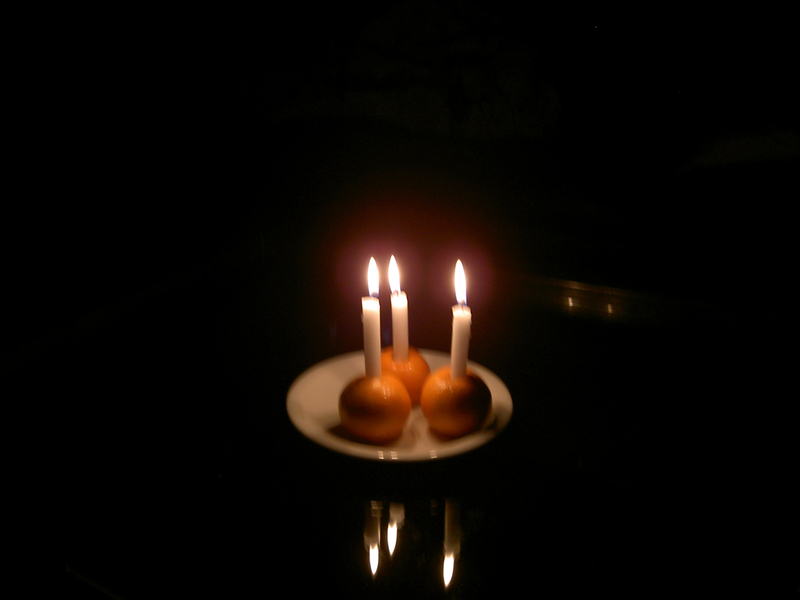 Shown here under our teeny-tiny little Christmas tree. We dug it out of the mountain forests last Christmas and it just about survived being totally neglected on the balcony all summer. It would have been nice to have a larger one — but have you ever tried to dig up a fir tree in the frozen ground? They have ferocious roots, so this is largest I could keep intact! I don’t much like cutting down trees. Decorated, needless to say, by the Small People. For a change, I decided not to machine quilt it. Instead, I sewed my father’s old shirt buttons at every intersection. This is probably as close to hand quilting as I will ever get. It makes it very squishy and supple, particularly as for once I used Quilter’s Dream poly batting made from recycled plastic bottles (from the ever-wonderful online shop of Ms E, physically located in Geneva). I hope this survives washing, but I did sew the buttons on quite ferociously using doubled embroidery thread. The spots on the back from a duvet cover I bought in the usual large Swedish store, with a strip on either side to make it a tad larger. Fabric from a variety of sources, including my old pyjamas (bottom right! ), assorted scraps and left over pieces from a Christmas charm pack. Assembled using my speedy system, bien sûr. I made it small, and narrow, so that it would nicely fit on a bottom bunk bed. 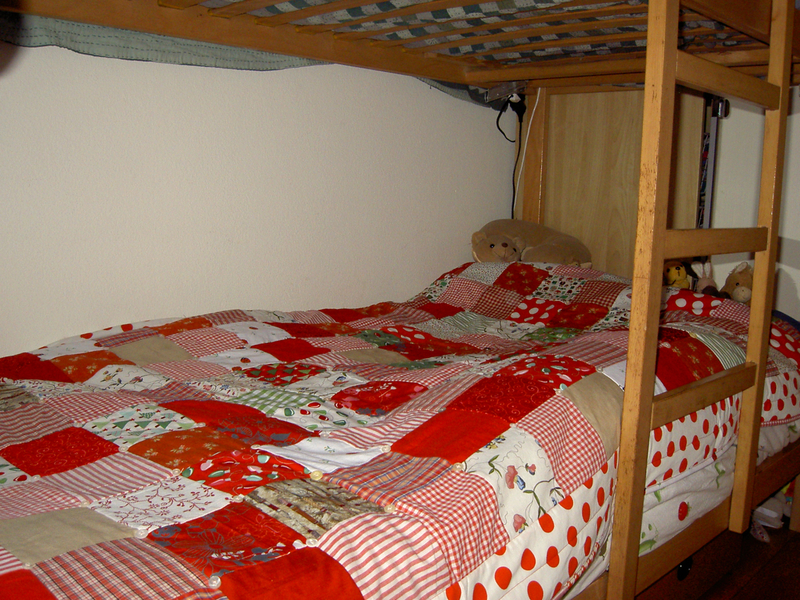 Have you ever tried making a bunk bed with a proper-sized single quilt? It’s hopeless. So this is perfect. I hope the littlest one in the family likes it! OK, so now that is done, maybe I can finally just sit and do NOTHING for a little while? Is that what I really want, anyway? Linking up to “Thank Goodness it’s finished Friday“, before heading off to see what others have been up to! 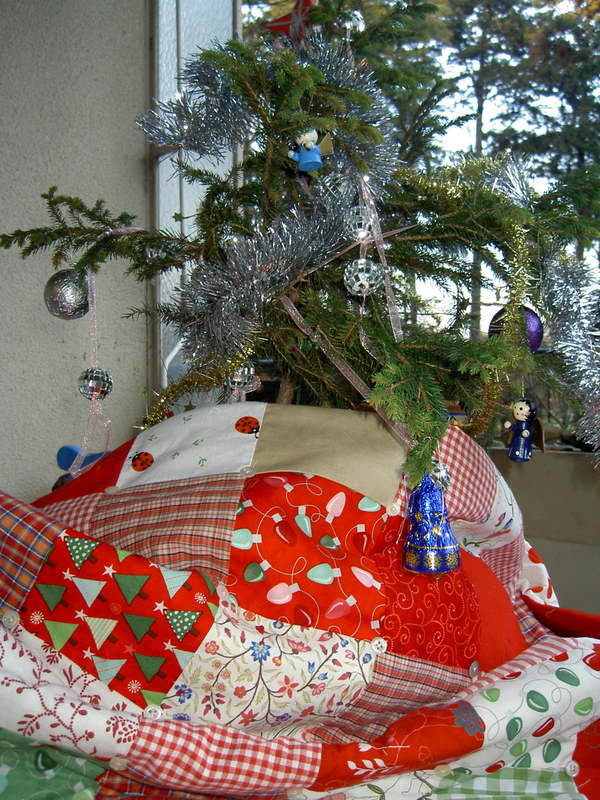 What a delightful Christmasy quilt! You did a super job! I love the button quilting. It looks great! 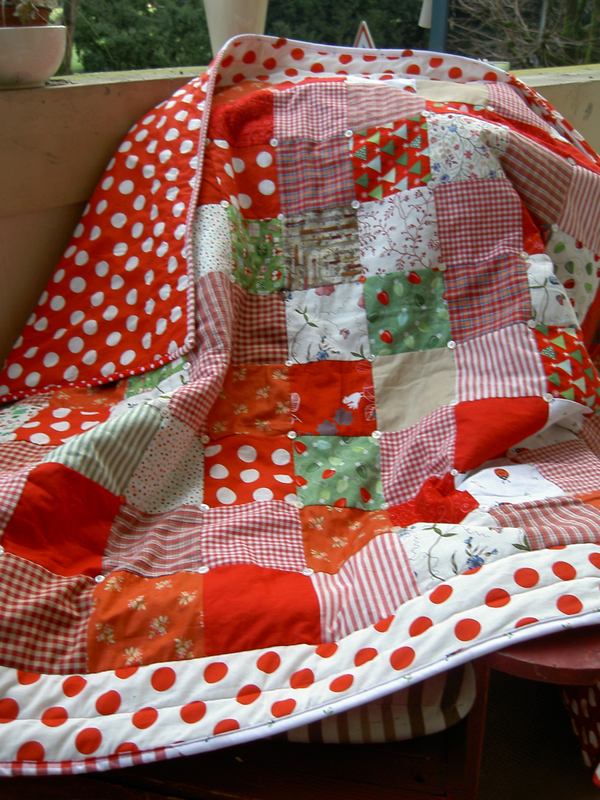 I am sure your littlest one is happy to have this sweet quilt!